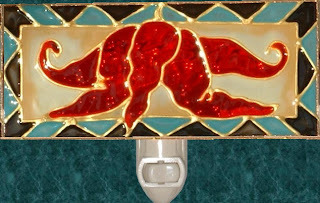 This southwest peppers hand painted nightlight was made in a low profile style in order to better fit under kitchen cabinets. The peppers are painted in two shades of red for dimension, against an ombre’d tan to cream background. The outer rectangular frame is painted with turquoise and black angular designs. Glass size is 6” wide by 2.75” tall.